Over the last few weeks I’ve highlighted college basketball teams on long ATS winning and losing streaks since they eventually come to an end. In the latest post, we saw Vanderbilt snap their 8-game ATS losing streak while Portland State had their 10-game ATS winning streak broken. You can’t just blindly bet on every team on a ATS losing streak while betting against every team on an ATS winning streak, but there’s definitely profitable spots to do so. What’s the significance of these ATS losing streaks, and how can bettors take advantage of them? The first step is knowing what has been historically successful– road underdogs on ATS losing streaks of at least five games have covered at a 55% rate since 2005 and have earned bettors nearly +50 units in that span (352-288-19 ATS record). It’s consistently been profitable and has a high enough sample size to be worthy of following. What I found most interesting when looking at long ATS streaks was the difference between road and home underdogs. My initial theory was that home teams would have a better chance to snap a long ATS losing streak with the help of their home crowd/court, no travel, etc. That was completely wrong, as home dogs have covered at just a 45% rate (compared to 55% for road dogs). Having access to quickly look up that information in Bet Labs is invaluable and will save you both time and money. On Thursday night, two teams are road underdogs on long ATS losing streaks. Eastern Illinois (+3) is at Morehead State and hasn’t covered for six-straight games. Northern Iowa (+5.5) hasn’t covered in five-straight games and will look to break the streak at Missouri State. In an OVC battle, the Panthers of Eastern Illinois are getting very little public love with just 18% of spread tickets. Across the market, bettors haven’t been willing to take the small road dogs but we’ve yet to see any line movement. Eastern Illinois has obviously struggled lately but they managed close losses against Nebraska and Marquette earlier in the season, so there is some hope. Morehead State is coming off three straight covers but all losses as big underdogs, and are in the rare position of the favorite tonight. I like the fact that we haven’t seen any movement away from Eastern Illinois despite lopsided public percentages on the home side, and I see the Panthers at least covering +3 tonight. We’ve seen different betting patterns in this MVC matchup with Northern Iowa getting the majority of public support (61% tickets) along with line movement in their direction (+6.5 to +5.5). This line even moved to +5 overnight before coming back up to +5.5 this morning. Northern Iowa has an inferior 8-6 record to Missouri State’s 12-3 mark, but the level of competition has been considerably better for Northern Iowa. The great part about following this ATS losing streak system is that public betting doesn’t hurt the record. In fact, road dogs on these 5+ ATS losing streaks have gone 77-53-3 ATS when getting the majority of tickets (51% or more). The sharps and public agree on taking Northern Iowa and the points tonight. These two teams have headed in opposite directions since December 10th, when Missouri State got worked at Oral Roberts, while UNI had dreams of a potential at-large berth after wins over SMU, NC State, UNLV, and UT Arlington. Since then, Missouri State has rattled off three straight wins, including a 2-0 start in the Valley, while UNI has lost four straight, including an 0-2 start in league play, after an inexplicable loss at home to SIU and a blowout at Bradley. Last year, Missouri State took the rubber match in the MVC tourney after each team won at home during the regular season. Defensively, both run modified pack lines that look to wall off the paint, as Missouri State allows the 4th lowest FG attempts at the rim in the country, while UNI is 69th in that regard, per hoop-math.com. Ironically, both offenses rely heavily upon post touches. Per Synergy, UNI runs offense through Bennett Koch in the post at the 9th-highest rate in the country, while Missouri State works through the more versatile NBA-talent Alize Johnson in the post at the 16th-highest rate. Missouri State has a decided advantage when it comes to post defense, as Paul Lusk has the luxury of not exposing his best offensive player in Johnson to fouls because of elite post defender Obi Church. Per Synergy, Church allows just .529 points per post possession. On the other side, Koch and Klint Carlson have allowed a poor .96 and 1.08 points per post possession. 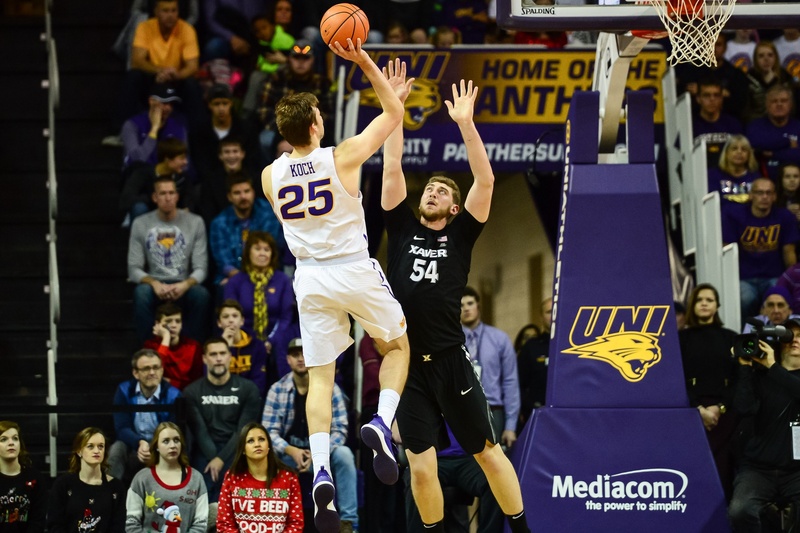 In terms of jump shooting, UNI has the advantage, especially if Spencer Haldeman returns to the lineup, as reports indicate. Additionally, the Panthers have rebounded on the defensive end exceptionally well against some of the best offensive rebounding teams in the country. Rebounding misses against the Bears is essential, as they grab their own misses at the 38th highest rate in the country, and score at 1.2 points per possession when they do, per Synergy. Neither team forces many turnovers nor allows much in transition, which means this game simply boils down to whether or not a good jump shooting UNI team hits shots. In their win over the Bears last year, UNI shot 10-22 from three. In the two losses, the Panthers shot a combined 10-43.